A hemicellulose (also known as polyose) is one of a number of heteropolymer (matrix polysaccharides), such as arabinoxylans, present along with cellulose in almost all terrestrial plant cell walls. While cellulose is crystalline, strong, and resistant to hydrolysis, hemicelluloses have random, amorphous structure with little strength. They are easily hydrolyzed by dilute acid or base as well as a myriad of hemicellulase enzymes. There are different kinds of hemicelluloses, including xylan, glucuronoxylan, arabinoxylan, glucomannan, and xyloglucan. 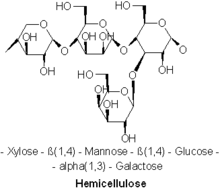 Hemicelluloses are polysaccharides often associated with cellulose, but they have different compositions. Hemicelluloses contain many different sugar monomers, while cellulose only contains anhydrous glucose. For instance, besides glucose, sugar monomers in hemicelluloses can include the five-carbon sugars xylose and arabinose, the six-carbon sugars mannose and galactose, and the six-carbon deoxy sugar rhamnose. Hemicelluloses contain most of the D-pentose sugars, and occasionally small amounts of L-sugars as well. Xylose is in most cases the sugar monomer present in the largest amount, although in softwoods mannose can be the most abundant sugar. Not only regular sugars can be found in hemicellulose, but also their acidified form, for instance glucuronic acid and galacturonic acid can be present. Unlike cellulose, hemicelluloses consist of shorter chains – 500–3,000 sugar units as opposed to 7,000–15,000 glucose molecules per polymer in cellulose. In addition, hemicellulose may be branched polymers, while cellulose is unbranched. Hemicelluloses are embedded in the cell walls of plants, sometimes in chains that form a 'ground' – they bind with pectin to cellulose to form a network of cross-linked fibres. Hemicelluloses are synthesised from sugar nucleotides in the cell's Golgi apparatus. Two models explain their synthesis: 1) a '2 component model' where modification occurs at two transmembrane proteins, and 2) a '1 component model' where modification occurs only at one transmembrane protein. After synthesis, hemicelluloses are transported to the plasma membrane via Golgi vesicles. ^ Scheller HV, Ulvskov P.Hemicelluloses. // Annu Rev Plant Biol. 2010;61:263-89. doi: 10.1146/annurev-arplant-042809-112315.